A few weekends ago we (that would be I and the gang of Botanical Beauties) were off again to a pretty special little town called Sharon Springs NY. 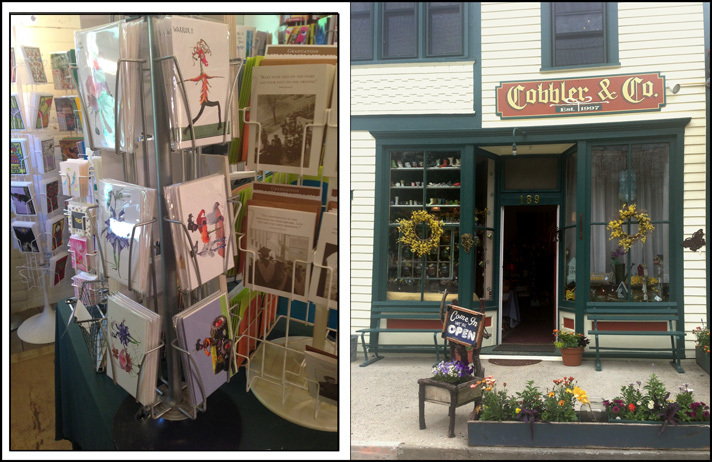 First, a heartfelt thanks and a nod to Cobbler & Co. located on Historic Main Street in Sharon Springs. They are now on the list of places you can walk into a brick and mortar store and buy Botanical Beauties & Beasties cards! It is a delightful store filled with wonderful treasures. Straight from their website- “Cobbler & Co. is a twelve-room eclectic gift shop. We offer an ever-changing array of gifts for you, your family, your friends, your home and garden and all of your entertaining needs...Take a look around our store and remember, we can ship anywhere!” (www.cobblerandcompany.com/index.html) If you find yourself in that neck of the country I highly recommend a visit. 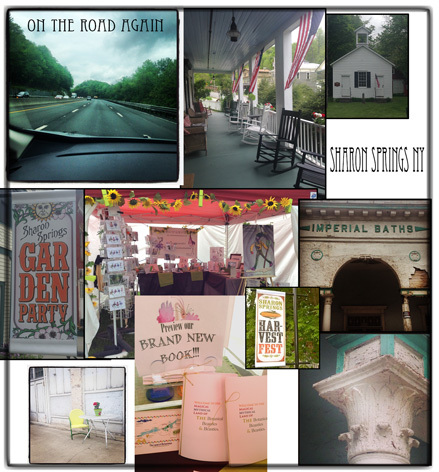 For that matter, there are quiet a few stops worthy in Sharon Springs and the nearby environs. Our cards displayed in the Cobbler & Co. card room. Hurrah! Which brings me to Sharon Springs generally. The 2,000 census counted the population as 547! Sharon Springs NY is up in the Mohawk Valley, not too far from Cooperstown for you baseball fans. The countryside is beautiful, the wonderful Adirondack Park and Catskill Mountains are close by borders giving you some idea of its beauty. The ride is about 3 hours for me, the people I meet are always warm and friendly, meaning both the town folks and the fair attendees. Although I am lucky to even get close to breaking even when I am done with gas, lodging, fees etc I find myself returning each time. Why? What draws me to these shows 2x a year? The annual Garden Party (as the spring show is called) and the Harvest Festival (as the Fall show is named)- it seems like a crazy idea to keep going? So, why do I keep returning? All this brings me to the words of hope, fascination, and charm. I think these may be the hidden charms of Sharon Springs? There is something a bit intangible about it all, but it is contagious. I never know whom I will meet, but they are inevitably interesting people at these festivals. Some of it is plan old small town living, some of it is who these festivals draw in, and some of it Sharon Springs and its community. Granted, The Beekman Boy’s name is behind these fairs, it was fairly predominate, now it is a bit obscured. (Their FB page.) As a matter of fact, ETSY will be running the fair in the fall, so well see how that plays out. Regardless, The Beekman Boys are still a “draw” and fans come out to play! There is a tour their home (a separate but planned extra if you so wish) and a fun array of other scheduled events happening on these weekends. For sure, it is a fun “weekend get-away” for many. I have decided to add to my weekend routine…after the arts fair is over on Saturday, I walk over (about 500 steps) and have a lovely cool cocktail on the amazing front porch of the American Hotel. Totally relaxing after a long day. One never knows who might turn up there to chat with, and I like that! It is what I consider a quintessential front porch, and I met the nicest folks last time. Part of what is fascinating about Sharon Springs NY is its history. Here is a brief glimpse. At one point, about 1836-1860, Sharon Springs was well know for its mineral water spa, with multiple large grand hotels and boardinghouses. “By 1841, the village had become world-famous as the social elite came to take the waters. Magnificent large hotels and forest-like parks graced the village landscape. During the second half of the 19th Century, Sharon Springs was home to over sixty hotels and rooming houses accommodating over 10,000 visitors each summer. By the early 1900s… the summer clientele with the influx of European visitors (had become) primarily from Judaic tradition.” (more info.) “Thanks to its sulfur, magnesium, and chalybeate mineral springs, Sharon Springs grew into a bustling spa during the 19th century. At the peak of its popularity, Sharon Springs hosted 10,000 visitors each summer, including members of theVanderbilt family and Oscar Wilde (who gave a lecture at the now-demolished Pavilion Hotel on 11 August 1882).” (more info) Sharon Springs also had a great location – in the 1800s two major paths (turnpikes and canals) were constructed and Sharon was connected to Albany as well as larger cities like NYC easily. Farmers with cash crops of wheat and hops were now well positioned to thrive. To add to the good fortune of Sharon, the Delaware and Hudson Railroad open a spur thru Sharon, and the age of the spa was pretty well golden! Eventually, as family (and so spa and hotel proprietors) aged, fires, a hops blight, Prohibition, plus a few more national factors, Sharon Springs thriving success was brought to a halt. Here’s an interesting tidbit According to a NYT article (26 August 2000) “After World War II, Sharon Springs got a second wind from the West German government, which paid medical care reparations to Holocaust survivors, holding that therapeutic spa vacations.” More info. )“ In 1994 Sharon Springs, and its Spa-related structures were added to the National Register of Historic Places and Sharon Springs became a Historic District. The walking tour and the accompanying plaques were created to guide visitors through our history. The plaques showcase the many buildings, some still remaining, some long gone and put them in their historical context.” (Here is a link to a brief, but complete story of the fascinating history of Sharon Springs. More info. In todays, world Sharon Springs is again picking its self up and seems to be a story of revitalization. There are charming stores and delicious restaurants to peruse and enjoy. It appears that growing communities of artisans (both material and culinary) are living, and moving to the area…and don’t forget-I always seem to meet nice people there! Need a break? Try out a visit during the Fall Festival Sept. 20 & 21, 2014: Arts, countryside, amazing food, fun, frolic, and pretty much guaranteed a pleasant time. Previous Previous post: Are they all Beauties? Is their a Beast? Next Next post: It’s always a good thing to join in and help others.